Those of you who identify as 'pro-life' may have experience this just as I have. Whether online or offline, you get bombarded by radical feminists or others who call themselves 'pro choice.' They use all kinds of crazy and irrational arguments in order to defend abortion. One such argument is the claim that fetuses, embryos, zygotes are not human. It is a strange argument just for the mere fact that human females gestate human offspring. A human does not become a 'human' at birth. He/she is human from conception with his/her own DNA, gender and blood type. Perhaps they should read my post: http://www.sacerdotus.com/2011/10/prochoice-debunked.html. Well, during the Superbowl the abortion group NARAL tweeted this tweet attacking the cheesy snack maker 'Doritos' over a commercial which aired showing a pregnant woman with and over active unborn child in the womb. The tweet is just unbelievable and hopefully exposes to the world the extremist and ignorant views of the pro-choice/pro-abortion movement which denies scientific facts in favor of sophism which they create in order to push the narrative of abortion. NARAL is the Westboro Baptist Church of abortion activism. Next stop: protesting their neighbors' baby showers and picketing Buy Buy Baby. @NARAL @Doritos "Humanizing"? Is it a lobster? @NARAL Uh, it is a human. You do know that, right?
. @NARAL So the "fetus" isn't human yet you call the man and woman dad and mom? Try again. And kudos to @Doritos! 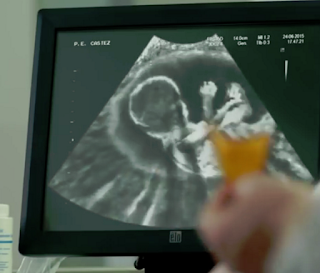 @NARAL @Doritos I wonder if humanizing fetuses has anything to do with the fact that human fetuses are, you know, human.